If you take a walk through Raleigh's historic district, just down the road from the Oakwood Cemetery, you might find yourself face to face with a dinosaur. The dinosaur's owner, attorney Jesse Womble Jones, dresses the dinosaur to fit the calendar. 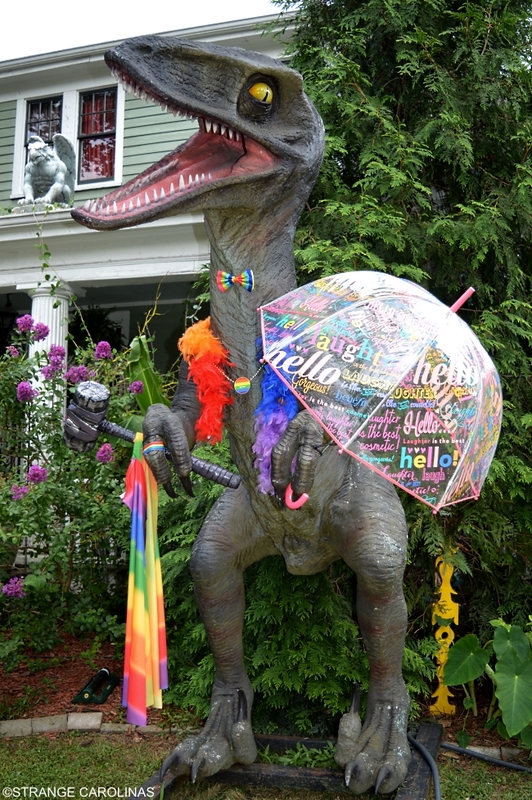 When we stumbled upon the dinosaur in June, he was dressed to the nines in support of LGBT Pride Month. Jesse informed us the following day the dinosaur was going to be outfitted in something a little more patriotic to celebrate the Fourth of July. Jesse also loans the dinosaur to neighborhood kids for birthday parties. But here's the really cool part: every October, the dinosaur becomes part of Jesse's elaborate Halloween celebration. The whole front of the house is decked out in monsters. Then on Halloween, the whole area (four blocks) is cordoned off by police so that area children can enjoy his show. He also enlists an army of friends to act as zombies to walk around the neighborhood and also gets his cousin, Caleb Womble, and Caleb's wife, Eulyn Womble, to lend a hand. Caleb was a producer on The Walking Dead and Eulyn has been the show's costume designer since 2011, so you know Jesse's Halloween festivities must be awesome!